Electro-soul duo. Or soul-electro duo. That’s how they describe themselfs. And they are two people. She and he. QUADRON. Soothing, pleasant, swaying, balsamic, divinely sweet sounds of Copenhagen. Nothing more, nothing less. This duo has everything to sound phenomenal. Soul in a lovely version. Their debut album, titled simply "Quadron" comes from 2009. 11 compositions in English plus one song sung in Danish - and everything so well matched and balanced. Sounds dressing the music in flowing shapes so perfectly, that you lose the sense of time and stress ... what stress? There’s only the desire to enjoy the sounds from Coco and Robin. Joyful, natural "Pressure", unpretentious “Slippin” (with beautiful saxophone in the background) or slow, calm "Day" show craftsmanship and class of Quadron. The singel "Slippin'" is available as a free download here. The video to the song is very interesting and pretty funny as well. On the album there are references to R’n’B’ or soul from USA - - "Jeans" or "Horse". 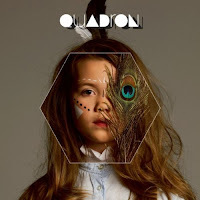 But Quadron is „floating in the air” different than Americans. More European, more unique. In my opinion – mission accomplished! The alternative to classic American R’n’B’climates for instance crushing "Far cry". My favorite song is a bit soft, dreamy "Average Fruit" with beautiful violin line and the Danish cover "Herfra hvor vi står".